Codling moth , also known as apple worm is the scourge of apple farmers and homesteaders alike. 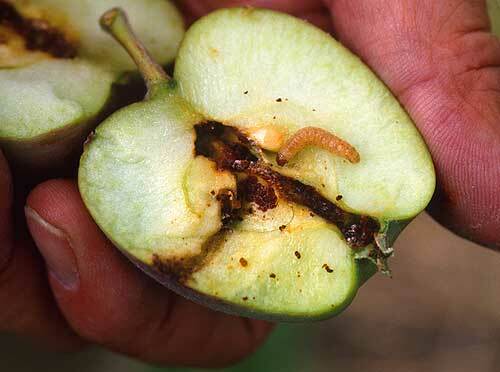 There is nothing worse than finding a worm in your apple - well there is - half a worm! - but this is a pest that not only attacks apple orchards but also quinces, peaches, nectarines, plums, eggplants and walnuts. The first sign of codling moth and that something is wrong with your fruit is when it starts dropping before it has reached maturity. This is because the caterpillar is in the fruit eating the seeds. Or, the fruit will rot on the tree due to infection growing from the entrance hole made by the caterpillar. Look at the top and bottom of the apples and look for a small brown hole. If present you have codling moth or apple worm. Each specimen will be found perforated by a worm hole. The egg has been laid in the calyx of the young apple, where it soon hatches into a small white grub, which burrows into the core, throwing out behind it a brownish powder. Codling moth larvae are very active tunneling into the fruit within hours of hatching and unfortunately once inside the fruit are resistant to any organic insecticides or pesticides. More bad news is that the codling moth can produce up to 3 generations a year depending on the climate. Thus, if you don't get these common pests under control your orchards will soon be ruined. After about three weeks of eating the apple the apple worm eats its way out, shelters itself under the scaly bark of the tree. If allowed to be scaly, or in some other hiding-place, spins a cocoon, and in about three weeks comes out a moth, and is ready to help destroy other apples. There is some good news however, and that is that the codling moth is rather lazy and doesn't move too far away from where it establishes itself. What has been found is that the male codling move moves within an area of 100 - 200 meters of where they were hatched and the female codling moth rarely moves more than 50 meters from where she has laid her eggs. This means that if you have finally been able to get rid of codling moth from your homesteads and orchards unless you are unlucky enough to have a neighboring orchard that is infested and less than 100 meters away from you, you should then be free of this pest. How do Orchards become Infected with Codling Moths? I can almost hear you asking the question, well, if this codling moth doesn't move very far how did I get this pest in my orchards in the first place? Well, they can be introduced in a number of ways, many of which you may not be aware. First of all the are introduced by fruit. Perhaps your neighboring farmer gave you some infected apples, or you just happened to pick some up at the farmers' market or supermarket? Another way of bringing in codling moth is with infected packing cases or wooden boxes that had apples in them. Codling moth can hibernate for up to 2 years until conditions are right, so very difficult sometimes to pinpoint exactly where and when the infection came about. Knowing this, even if you have managed to eradicate the moths from your orchards, be on your guard, because they could easily pop up a couple of years later. As mentioned above, codling moth can be introduced into your farms via a number of different ways, and it is these than need to be avoided. So how do you prevent codling moth? Check the fruit you receive or buy very carefully. Don't bring home any old packing cases or wooden boxes that have been used to store apples, quinces or other stone fruit mentioned, or where this fruit has been stored in close proximity. If you do end up with infected fruit don't throw them in the compost heap or in the bin. Rather boil them in boiling water for half an hour and then keep them submerged for a couple of days just to be on the safe side. If you have pigs feed them to them straight away, or feed them to the chickens. If you have a hot compost heap put them in there. Caterpillars are eaten by birds, ants and wasps. However, you will need to attract these good insects into your garden and orchards. Wasps and hoverflies are attracted to these flowers and will feed on the caterpillar lavae at the same time, cleaning up your orchard. Even if you don't have apple worm in your quince and apple orchards now, if you plant parsnips and flowering umbellifera now it will be a prudent preventative measure. Plant flowering umbellifera near your apple trees. 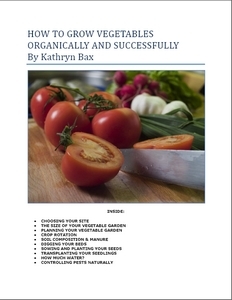 Parsnips are also effective, and probably the easiest as they are self-seeding once they are allowed to go to seed and will come up year after year. Allowing your pigs, sheep, ducks and hens into your orchard from time to time allowing them to eat any fallen fruit is another way of cleaning up your orchard and preventing an infestation. One method of organic control is to codling moth traps . To do this you need to take an old can, make two holes on opposite ends of the rim and make a handle out of string or wire so that you can hang these up in the tree. Now fill with 1 part molasses to 10 parts water. Hang the traps in the trees and then every week empty and refill. If you find any moth inside the traps that you can identify as a codling moth - see our page on garden pests for an image to confirm identification - then you need to start spraying. Continue your organic spraying regime for 2 weeks longer than your last catch. Place mixture into a 5 gallon plastic jug and make 2 round holes in each side at the top to allow the codling moth to enter the jug. Tie in the trees with an old stocking or similar around the handle. Another way to control codling moth is to place grease bands on the trunks and all the main branches. This prevents the caterpillars migrating up the trunks in search of an apple to lay its eggs. As caterpillars don't fly and move from the ground up, and along the branches, this is a good first start. Trees should also be scraped free of all scales in the spring, and washed with a solution of soft soap. About the 1st of July, wrap bandages of old cloth, carpet, or rags of any kind around the trunk and larger limbs. The worms will appreciate such excellent cover, and will swarm into these hiding places to undergo transformation into moths. Therefore the wraps of rags should be taken down often, thrown into scalding water, dried, and replaced. Spraying your orchards is a last resort as even organic sprays can be harmful to other insects, especially bees. However, sometimes you have no option. The best sprays for codling moth are Ryania, Dipel and Derris. Ryania is good for cooler climates and works well and getting rid of both caterpillar and moth. It also kills Japanese beetles, squash bugs, potato aphids, onion thrips, corn earworms, silkworms. Deriss will kill the moths, but not the grubs. Spray Dipel on the apples themselves and do this every week, while spraying Derris every 2 weeks. Continue this spraying schedule until there are no more moths in your traps. Add your Own Comments on Codling Moth here! Do you have anything to add to our article on apple worm? Feel free to leave a comment.